Safety is one of the most important elements of any vehicle, and automakers will go to great lengths to prove just how safe their cars are. 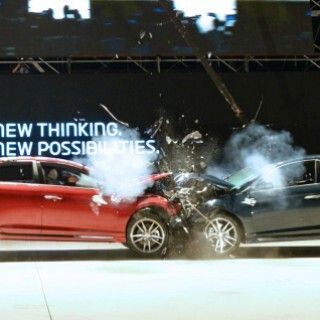 Hyundai recently performed a crash test that saw a pair of Sonatas collide head on at a speed of 56 kilometers per hour. One of the vehicles was manufactured in Korea, with the other coming from the US. While this may seem like a rather unimportant fact, Hyundai Motor Company did it this way to show that their vehicles are safe no matter where they are made. The test proved to be a success, as both vehicles held up very well in terms of damage after the crash. The Hyundai Sonata is now in its seventh generation, and is more refined looking than ever before. It rides beautifully, too, as a stiffer body structure is used, which helps improve NVH levels. The vehicle also comes with a host of safety and convenience features. The safety elements begin with the use of seven airbags as standard. This includes a driver’s knee airbag which is in place to ensure that the driver does not slide down the seat in a collision. This helps the restraints do a much more effective job. Other standatd safety features include Traction Control, Electronic Stability Control, Vehicle Stability Management, Tire Pressure Monitoring System, ABS, and individual tire pressure display. Projector headlights come standard, and there is also an option for HID headlights. Hyundai enigeneers worked hard to ensure that all of the safety technologies included in the new Sonata would prevent collisions, but also protect the driver when they do occur. Other features, which are usually only found in luxury vehicles, include Blind Spot Detection, Forwards Collision Warning, Land Departure Warning, and Rear Cross Traffic Alert. Once the turn signal is activated, the Blind Spot Detection system automatically alerts the driver to vehicles approaching from behind. The Lane Change Assist system is an active safety feature that is a segment exclusive. Warning lights display in the side mirror once an approaching vehicle is detected. The system quickly determines the speed of the closing vehicle and determines whether or not it is safe to change lanes. If the vehicle is approaching to quickly for a safe lane change, an audible alarm is sounded. A forward-facing camera is at the heart of the Lane Departure Warning System, and is used to recognize lane markings. If it appears that the vehicle is about to drift outside of those markers, a light in the dashboard comes on, and an audible sound is heard. The Rear Cross Traffic Alert System also worls off the Blind Spot Detection System. It uses cameras to scan each side of the Sonata to spot vehicles backing out of parking spaces. When the system detects a vehicle making that move, an audible alert is sounded in the cabin. As you can clearly see, the new Hyundai Sonata is a vehicle that is among the safest you can get behind the wheel of.